A seaworthy powerboat with character, a cuddy cabin, and lots of fishability. Like most longtime boaters, Larry Dario started young, around 6 years old. The 52- year-old dentist from Warren, R.I., remembers sailing a Tech dinghy at a summer camp on Boston’s Charles River, and other sailboats followed: the 110, Solings, International One Design — all classic designs. 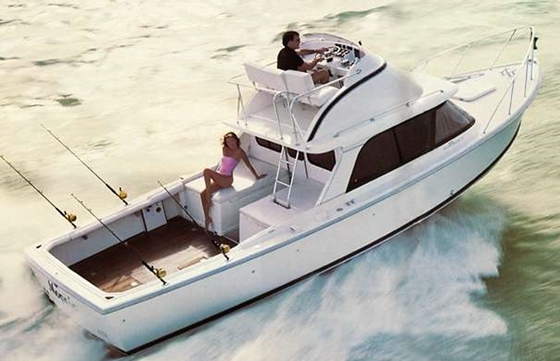 Larry Dario converted this Blackfin 29 Combi from a cruising model to a fishing boat. So when it came time later in life to get into powerboating Dario started out with character boat, too, buying and restoring a Bertram 25 Moppie to serve his passion for fishing. Eventually, he sold the twin sterndrive express to a Swedish yachtsman who put it on a container ship and rode away. 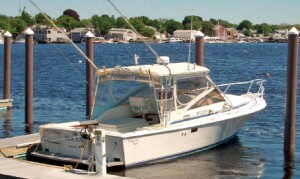 Now Dario has himself another “keeper,” a 1986 Blackfin 29 Combi, and the cuddy cabin sportfishing cruiser is another classic, this one with deep New England roots. 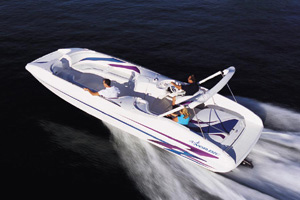 That pedigree helped Dario decide to buy the boat, sight unseen, in 1996 from a Naples, Fla., owner. The price was around $39,000. 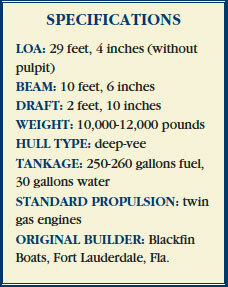 The boat’s custom 290-gallon fuel supply means a range of around 400 miles. “You can cover a lot of distance in this boat,” Dario says. The boat sports plenty of rod holders now, along with an aluminum half-tower, outriggers, raw and freshwater washdowns, a bow rail and pulpit, even an EPIRB and a life raft. “Stuff happens offshore,” Dario says. And that’s where the 29 Combi truly shines. A low center of gravity moderates the snap roll, making for a stable fishing platform. The engines are far apart, set low in the deep-vee hull, and the high-aspect rudders are externally hung. The Blackfin 29 Combi (and later 29-2 Combi) rides a true deep-vee hull with 22 degrees of transom deadrise, matched by a sharp entry conducive to offshore performance. 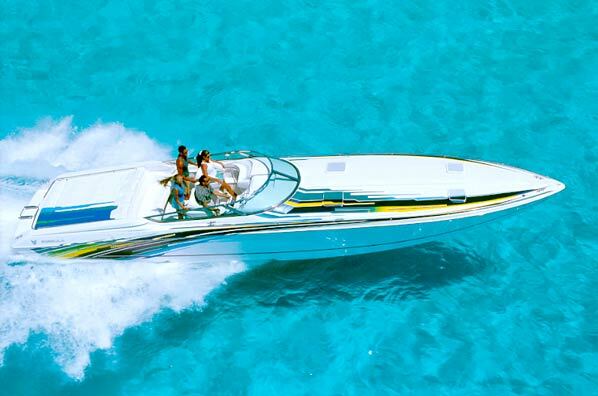 Combined with a wide beam that exceeds the usual 1-to-3 beam-to-length ratio, the overall shape delivers what one observer calls an “incredible rough-water” ride. 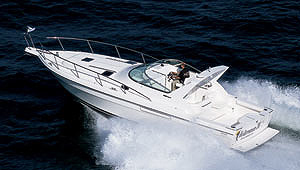 The original’s open express profile shows a moderate, even sheer over a low hull with plenty of bow flare and a slightly curved transom. The helm is to starboard on the raised bridge deck, behind a large, three-panel wraparound windscreen, with a small panel for electronics. The 29-2 Combi, introduced in 1995, came with a redesigned instrument console and a curved windshield. 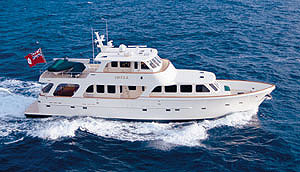 In both, the cuddy is laid out with the basic necessities: enclosed head compartment, compact galley area with a small stove and refrigerator and a convertible dinette/twin berth forward. Power in the original 29 Combi was standard twin gas engines around 320 hp for a cruising speed of around 25 mph. 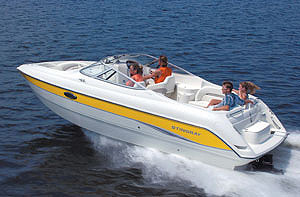 Diesel power plants (320 hp) deliver a cruising speed closer to 30 mph and a top end of 35 mph. The original Combi’s cockpit engine boxes were converted to an aft-facing lounge seat on the 29-2. The Blackfin 29 Combi (and 29-2) is readily available on the used boat market, thanks to its reputation for fishability and durability. 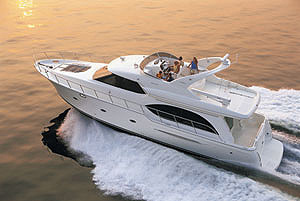 Prices generally are in the five figure range, with some newer or better-equipped boats fetching around $100,000. Here are a few examples: A “clean, one-owner” 1995 model was available in Massachusetts for around $85,000, with twin gas engines, GPS/chart plotter, fishfinder, autopilot, radar, tower and upper controls. A 1986 Connecticut boat “in excellent condition” was listed for around $75,000, with a pair of new Volvo diesels, all electronics, and such fishing extras as outriggers. Another Massachusetts boat, vintage 1996, was listed for just under $100,000, with twin 318-hp diesels, custom tower with controls, and outriggers. In New Jersey a 1987 Combi was priced at just under $105,000, with twin 300-hp diesels, fighting chair, outriggers, washdowns, rocket launchers and spotlights. Steve Knauth is a contributing writer for Soundings Magazine. This article originally appeared in the January 2007 issue.